The first recipe for 2014 comes to you courtesy of Leslie Hammond and Betsy Laakso’s book, “Gluten-Free Desserts“. I have a couple other recipes earmarked in their book on account of the great pictures and the convenience of the recipes being explicitly gluten-free to begin with. I chose this one on the appealing thought of making something heavily involving apples. That makes for three fruit-centric recipes in a row after December’s Blueberry Honey Oatmeal Squares and November’s Orange Spice Cookies, all notably lacking chocolate. Don’t worry though, we’ll soon be back to something that makes appropriate use of unhealthy amounts of chocolate. 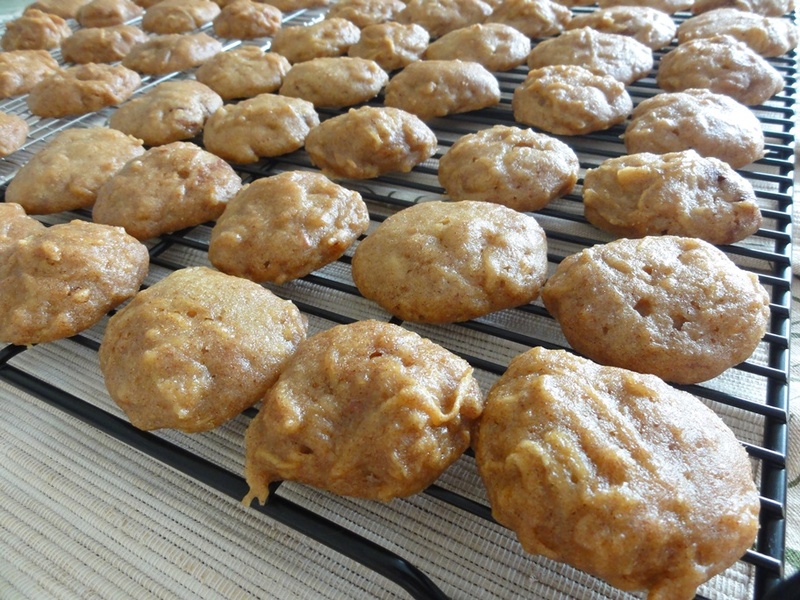 In hand with the Orange Spice Cookies these apple cookies also qualify as vegan with applesauce and vegetable oil substituting for eggs and butter as the base. My best guess is that this exchange is responsible for the unusual texture these cookies exhibit in that they’re spongy. This is not a bad thing; they hold together very well because of this and are one of the least messy cookies I’ve eaten, but the consistency is more like that of a moist cake than a cookie and that’s a little unexpected. It suits the apple flavor well though so it gets my vote of approval! Grating the apples is the largest contributor to the preparation time for getting these cookies in the oven; after that they’re simple to throw together. 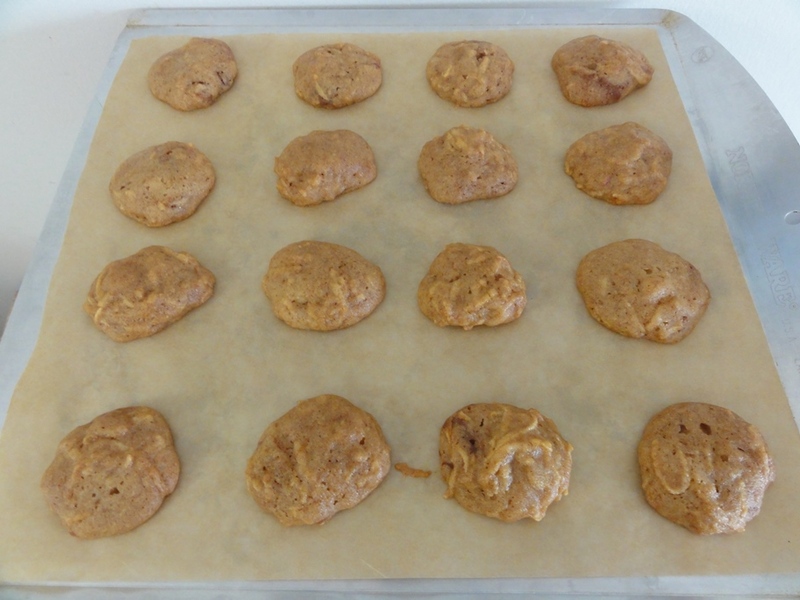 They spend a while in the oven at 15-18 minutes per sheet, and I got just over 50 cookies out of one batch of dough, so make sure to plan ahead! Preheat oven to 350°F, line baking sheets with parchment paper. Cream the applesauce, oil, vanilla, brown sugar, and salt together until well-combined; about 2 minutes on low-medium speed. 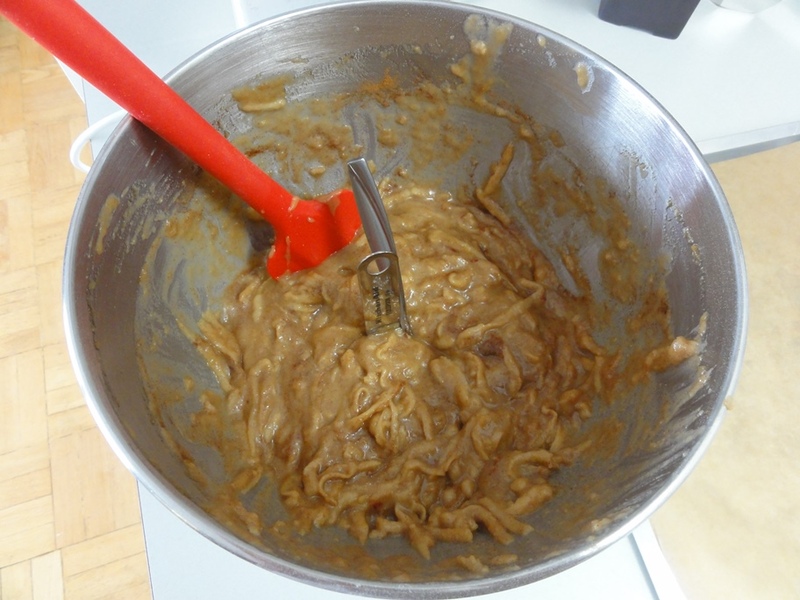 Whisk together the flours, ginger, baking powder, and 1 tsp of the cinnamon in a medium bowl. 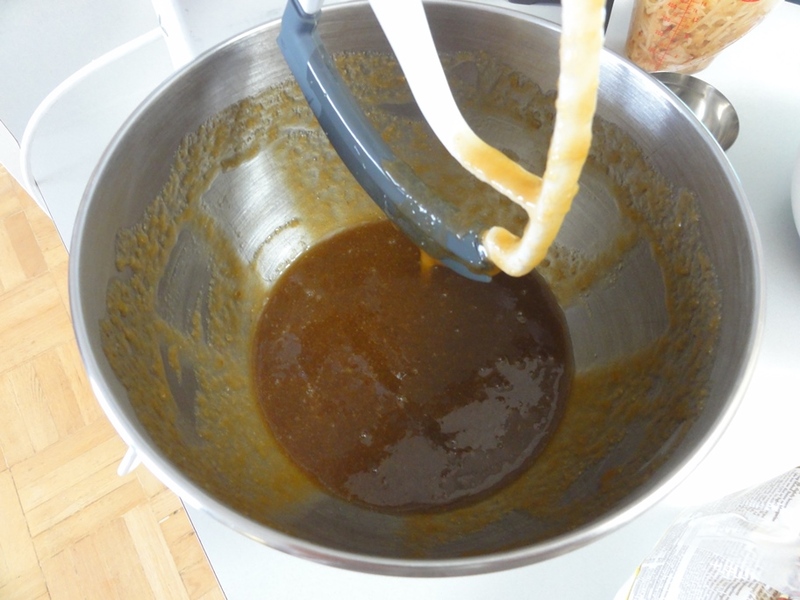 Add the dry ingredients to the wet in small quantities, blending on low speed until well-combined. 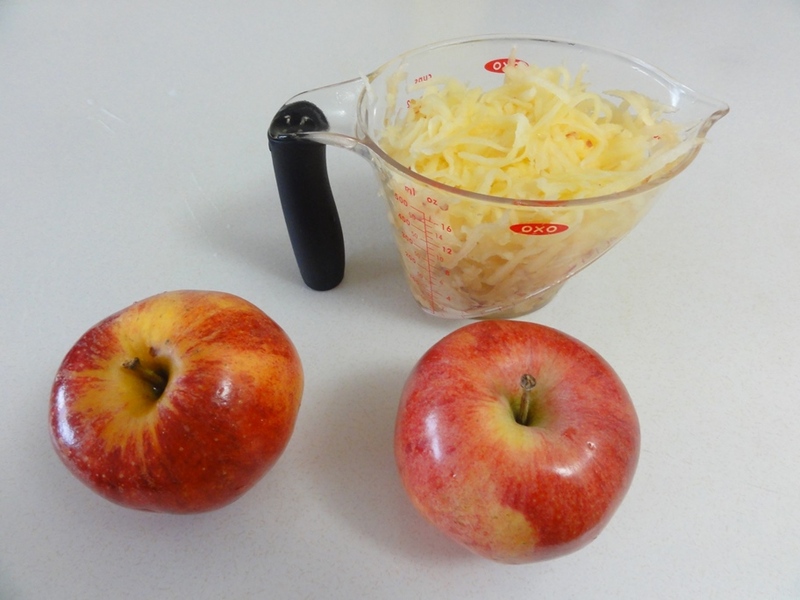 Fold in the grated apples. Let dough sit for about 3 minutes. Spoon the remaining 1 tbsp of cinnamon into the center of the dough and gently fold it in without over-mixing; leave streaks of cinnamon throughout the dough. 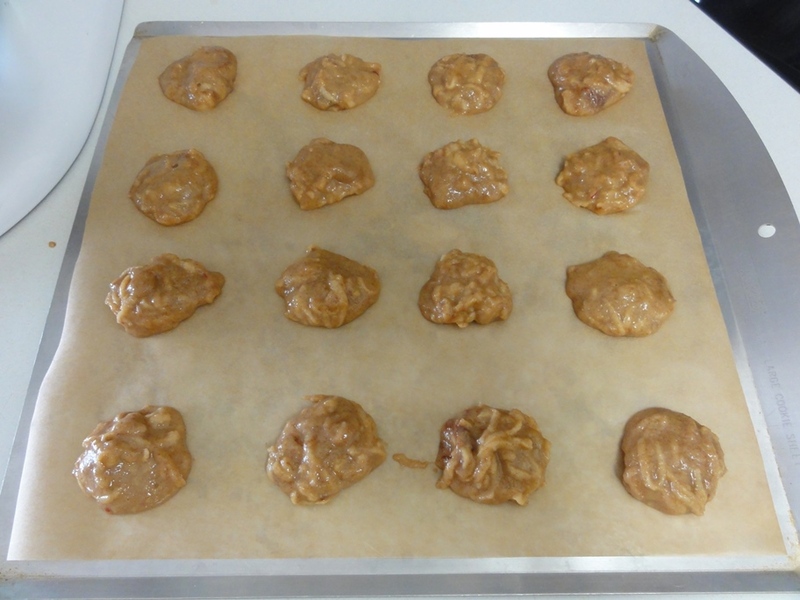 Drop rounded tablespoons of dough onto the lined baking sheets. Bake for 15-18 minutes; the tops will be dry and the cookies firm when done. Let cool for 2-3 minutes on the trays and then transfer to wire racks to cool completely. To take these cookies a step further towards suiting dietary preferences I think you’d be safe to swap out the brown sugar for unprocessed cane sugar, given the success with that in the Orange Spice Cookies. I would like to know what these taste like with maple syrup involved but that would be swapping dry sugar for liquid and that’s generally not a safe idea. Per my next thought I am keen to try making these again and will report back after I’ve tried them with unprocessed sugar. Next time I make these I’m going to add a cup of toasted, rolled oats along with the grated apple. I think that would help dry them out a little and shift the spongy texture towards something more hearty. Apples and cinnamon also happen to go very well with oatmeal, so it seems like a good combination to try. The original recipe calls for a cup of raisins to be folded in at the same time as the grated apple. I chose to leave them out purely on a whim and I’m happy with the result. I think the raisins would have been just a little bit too unusual in the cake-like texture, but if you really like raisins, you should try including a cup! I got two cups of grated apples out of two apples similarly sized to these, which seemed about average among what was available at the market. Depending on what kind of apples you can get your hands on you’ll want to adjust how many you pick up accordingly. The original recipe didn’t specify any particular kind of apple so go with what you like the most! The wet ingredients will blend together to a soupy consistency. 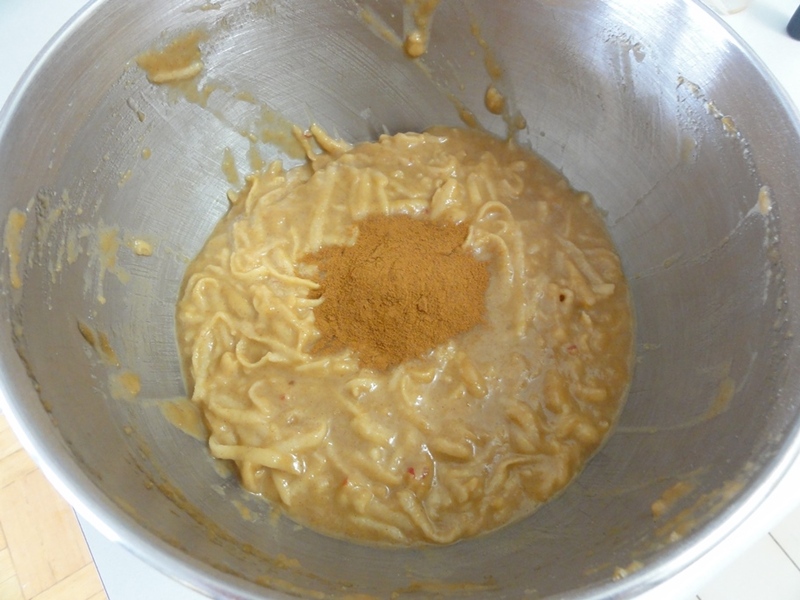 I neglected to take a picture of the dry ingredients before whisking them together, but again as with the Orange Spice Cookies you can take advantage of the spices to see clearly when the ingredients have been properly blended together because the mixture will have a consistent color different to what you started with. 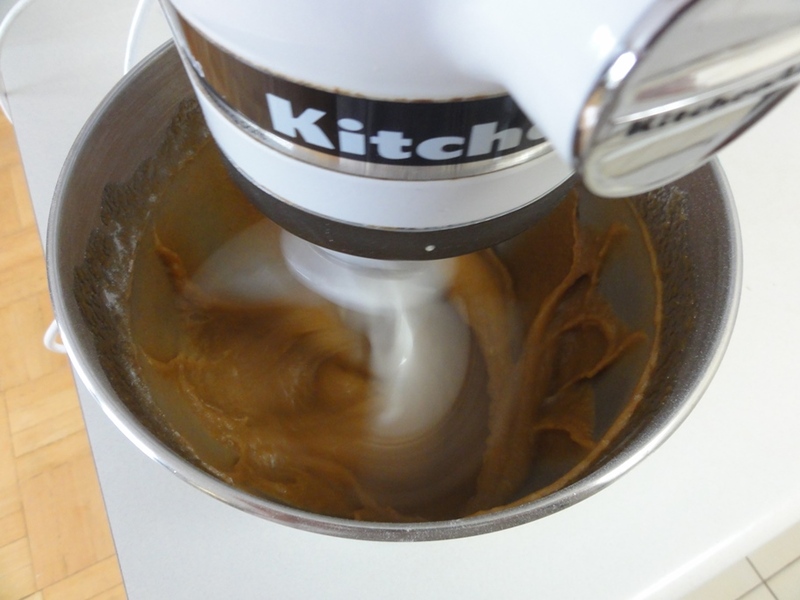 It’s been a while since we last had an action shot of the stand mixer, so here it is with the last of the dry ingredients added in. 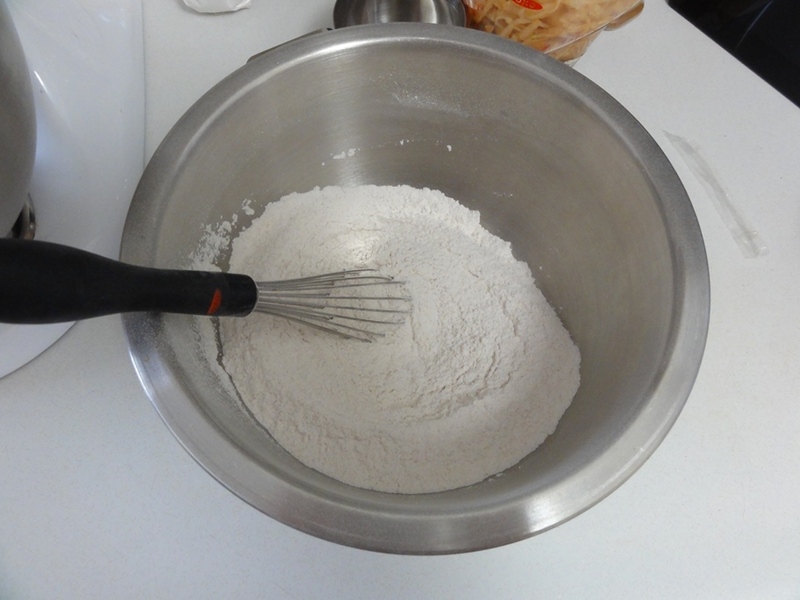 Remember to add the dry ingredients in small quantities at a time (~1/4 cup is fine). 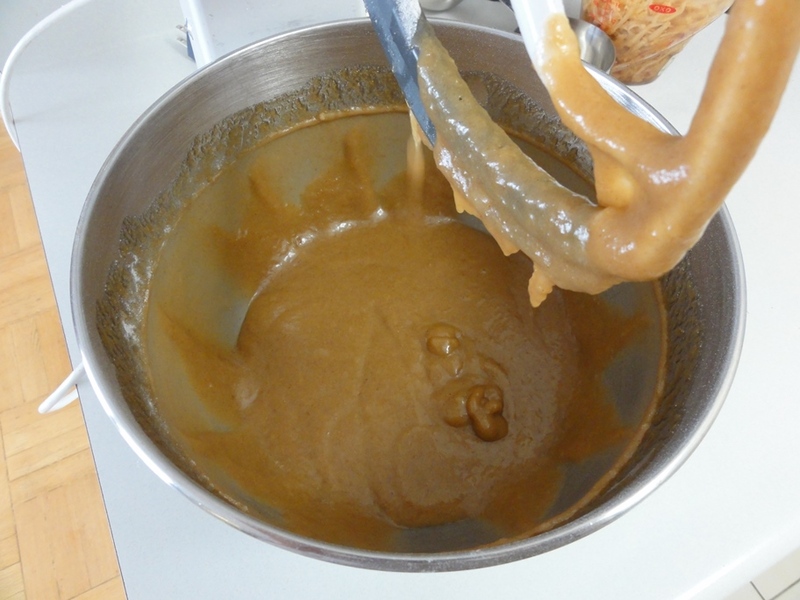 The dough takes on a caramel consistency when blended together. That’s another thing that goes well with apples! When you add in the grated apples though you get something that doesn’t look particularly appetizing; vaguely like canned spaghetti but the wrong color. The final step is one that my folding technique is not quite up to the task for with the idea being to leave “streaks” of cinnamon throughout the dough. I figure you can count it as success if you end up with what I got and small clumps of cinnamon in each cookie to provide bursts of flavor. 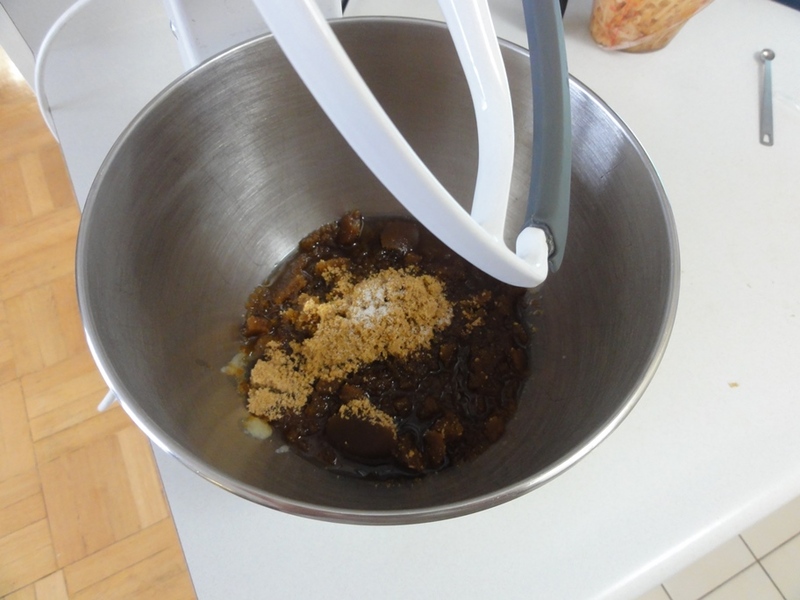 If you leave a lot of the cinnamon in one place someone’s going to get an unpleasant surprise when half of their cookie is powdered cinnamon, so let’s just say this step takes some finesse to get right. 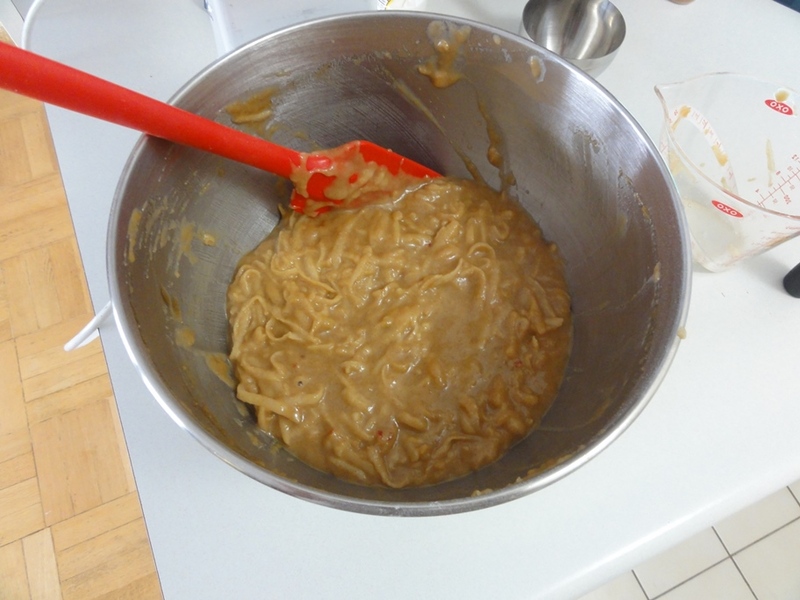 The moist dough is easy to work with, and more importantly, once baked up the canned spaghetti impression goes away! I opted for 16 cookies to a sheet because I wasn’t sure how much they’d spread out. The moist dough is deceptive; they spread only slightly in the oven and you could probably fit 20 on a sheet and save some time in baking up the batch. 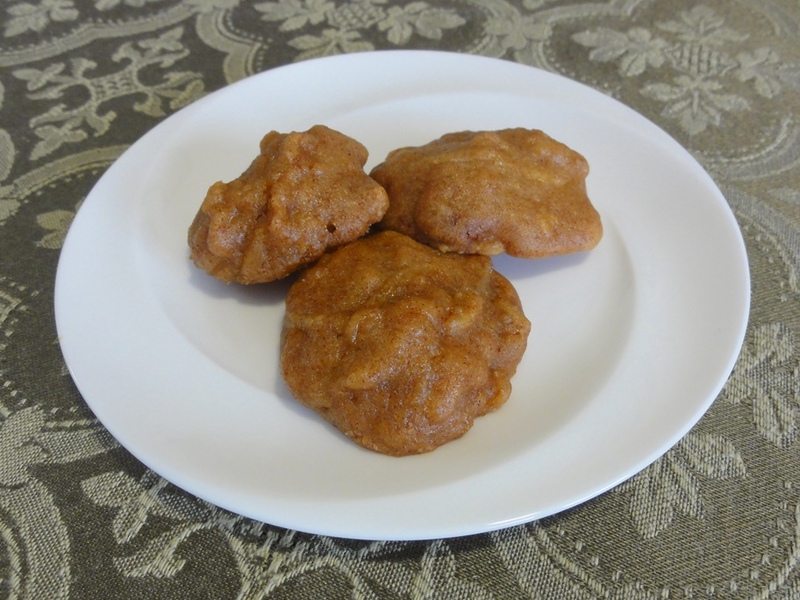 I’ll leave you with three spongy apple cinnamon cake cookies on a plate, waiting to be eaten!